Majja Run participants in the TCS World 10k Bengaluru 2017 held at Kanteerava stadium here yesterday. It is not difficult for Sourav to leave a warm bed on a cold Bengaluru morning to seek out his addiction. He and his bunch of friends head straight to BTM forest every morning to satiate their daily dose of cravings. Sourav and his friends are not the only ones who have turned to running, an inexpensive sport and increasingly a new-age addiction. “All you need to do is put on your running shoes and start running. Once you are convinced about the sport, it doesn’t take you much time to get addicted to it,’’ he says with conviction. “It takes some time to get into the groove and then you do not need anyone. It soon becomes an addiction which is hard to get rid of,” he adds. An ace runner now, who has participated in some of the elite runs in the country -- Airtel Hyderabad Half-Marathon, Mumbai Marathon, TCS World 10K Bengaluru --, Sourav took to the sport in response to the health concerns that started plaguing him when he found it surprisingly difficult to run and catch a bus. “By the time, I boarded the bus; I had to stop to catch a breath before I could ask for a ticket from the bus conducter. I realised that day, that something is horribly wrong with my fitness,’’ says Sourav Samadder (29), a member of BTM Forest Busters, one of the many running clubs in Bengaluru. 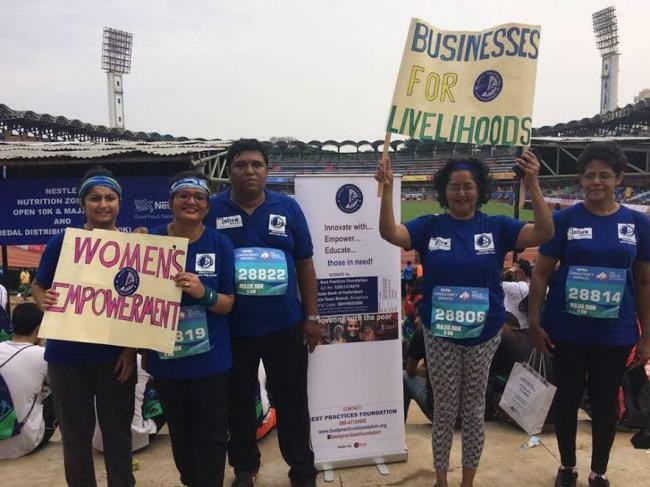 Best Practices Foundation, one of the participating civil society organisations, at the TCS World 10k Bengaluru 2017 held at Kanteerava stadium here yesterday. It is the likes of Sourav who propel the growing popularity of Marathons across India. 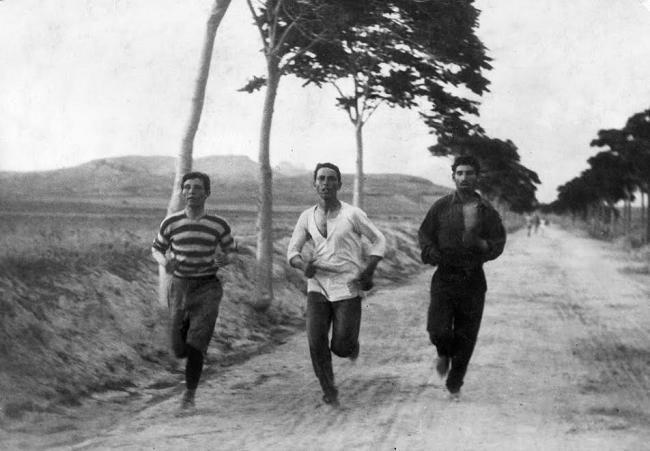 To go back in time, it may be recalled that the first organized marathon was held in Athens at the 1896 Olympics, the start of the Games’ modern era. Marathon was instituted in commemoration of the ancient time's fabled run of the Greek soldier Pheidippides, a messenger from the Battle of Marathon to Athens, who reported the victory. The marathon technically is a long-distance running race with an official distance of 42.195 km, Every year more than 800 marathons are organized across the world and some of these belong to the Association of International Marathons and Distance Races (AIMS) which has grown since its foundation in 1982 to embrace over 300 member events in 83 countries and territories. For a group like the BTM Forest Busters in Bengaluru however, the main motto is to loop in every individual who is interested to stay fit. Thus the group of young runners is growing every day, as more and more run enthusiasts join the group as a means to stay alive and kicking. The group not only has an active gang of runners, they also offer free training programmes that would help to build the stamina of runners and enjoy a run without injuring oneself. 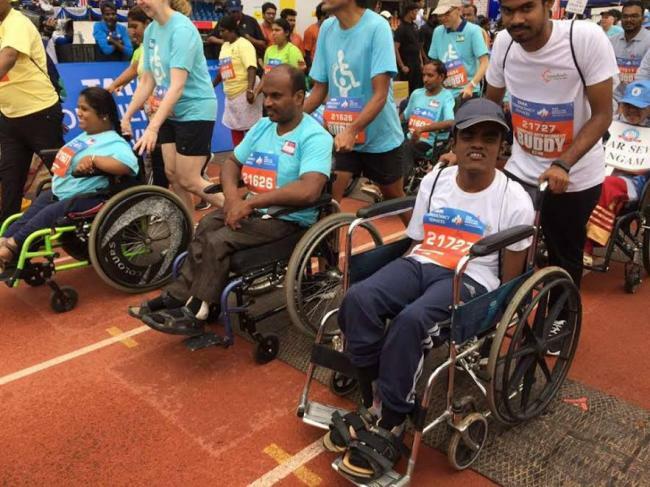 Differently-abled participating in the TCS World 10k Bengaluru 2017 held at Kanteerava stadium here yesterday. Siddharth Jena, one of the many members of BTM Forest Busters, took to running as it seemed to be one of the easiest things to do. “I wanted to get involved in some kind of physical activity. I cannot join a gym because the hours aren’t that flexible. Running seemed the easiest thing to do as you are not bound by strict timings. You can run whenever you have time,” Siddharth says. “His first formal run was Wipro 10K way back in 2016 and is currently preparing for the tough 21K,” he adds. With the number of serious runners increasing by the day, training centres for those keen on the sport is also growing. In keeping with the growing surge of runners in Bangalore, a number of training centres have proliferated, offering expert guidance and support. One such organisation is Pacemakers who train up novices in the sport. Started by coach Pani, it is a running group of spirited long distance (from 10K to Marathon) runners of all abilities – ranging from novice to experienced. Coach Pani -as he is fondly called - took up serious running during his Indian Air Force days. While serving the country for 21 years, he also participated in various middle distance running competition and winning them. Today, he is also heads Bangalore Nike Running Club. “A structured training plan is developed for each athlete, based on their current performance, fitness and individual aspirations,’’ Pani says. Over the years, the marathons have also emerged as a potent platform that helps non-profits raise funds for charity. 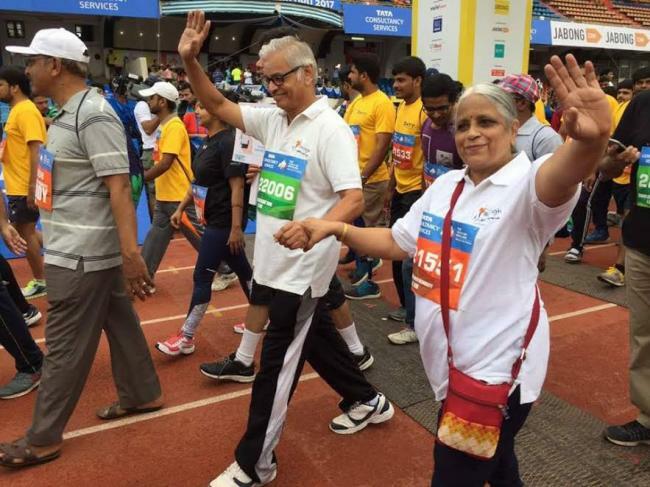 Senior citizens participating in the TCS World 10k Bengaluru 2017 held at Kanteerava stadium here yesterday. One such run is the TCS World 10K Bengaluru which is an annual 10 kilometres road running competition held in Bengaluru. The competition was first held in 2008 and usually takes place on the 3rd Sunday of May annually. 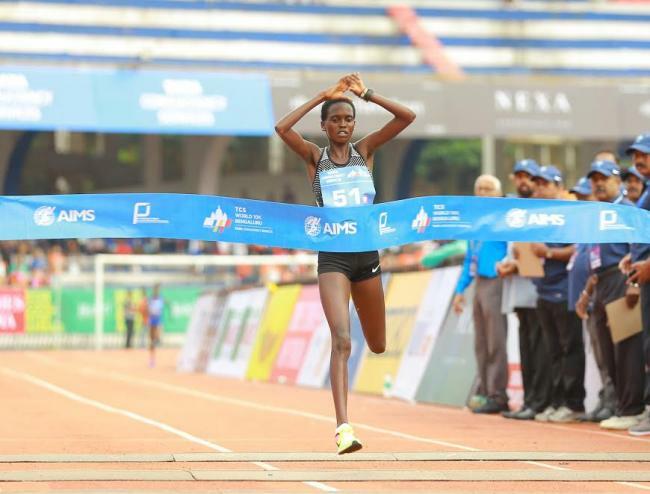 The race, which is AIMS-certified, begins and ends at the Sree Kanteerava Stadium, after looping through the roads of Bengaluru. The different race categories at the event are – World 10K (participation restricted to International and National athletes), Open 10K (participation open to amateur runners), Majja Run (a 5.7 Km run meant for fun runners), Senior Citizens’ Run (a 4.2 Km run for Senior Citizens, and the Champions with Disability event (a 4.2 Km event for persons with disability). Sharing the details on this years’ fundraising efforts, Murray Culshaw, Chairman India Cares Foundation, the Philanthropy Partner of the TCS World 10K Bengaluru 2017 says, “India Cares has been associated with the TCS World 10K Bengaluru since inception and we have seen a remarkable increase in the number of individuals who are using the platform to raise awareness and funds for various causes. “This year, we also announced an initiative to ‘give back’ to the city, with the Cubbon Park Rejuvenation project, which we are confident that the citizens of Bengaluru will contribute back to. The need for a more caring society is growing and this is the perfect way to start than to support causes of choice and your city. We all get better together,” he adds. “There are some premium runs in the country like the Standard Chartered Mumbai Marathon, the Airtel Delhi Half Marathon, the TCS World 10K, together these races get close to a 100000 people running but the interesting part is that these also serve as excellent platforms for raising funds by the civil society organisations. These races cited above have helped raised over Rs 200 Cr in the last 10 years and it is expected that they would have raised Rs 500 crore by 2021,” he added. Civil society organisations that reach out to the public and be accountable have been able to use these platforms to showcase their cause and also raise substantial funds (predominantly non-restricted). Several organisations have raised in excess of a crore at each of these events. There is more that will come in this space with smaller towns also now taking to sports and races, he informed. BPF is a Bengaluru-based NGO founded in 1999, to improve the quality of life for poor and marginalised communities through livelihood interventions. BPF’s own livelihood model Market Oriented Value Enhancement (MOVE) was bestowed with a global award for its innovativeness in increasing opportunities and enhancing livelihoods for rural youth and women. The TCS World 10K Bengaluru, which has raised over Rs 26.34 crore for civil society organisations across all causes since its inception in 2008, continues to be South India’s largest single fundraising platform, with Rs 4 crore raised to date during the celebratory tenth edition of the run. The funds of Rs 6.05 crores raised through the 2016 edition of the run, impacted over 80,000 individuals, directly and indirectly. Causes benefitted included providing mobility aids, education in balwadis to higher studies, vocational training for livelihood, healthcare from medical camps to specialised operations, tree plantation for farmers to sustain their livelihood and setting up of long-term building foundations and supporting budding athletes in Olympic and Para-Olympic sports. The 2017 edition witnessed the participation of 30 companies with 43 teams, over 200 charity fundraisers, and more than 6000 donors. The list of contributing corporates who donated to various causes includes Inflow Technologies, Emids Technology Pvt Ltd, KPMG, San Disk India Device Design Centre among others. Amongst the 6,000 donors running for a cause, the starting line-up included 17-year-old Ishana Sundar, a full-time high school student and a part-time astronomy enthusiast who strongly believes in empowering the young woman. Ishana will be running for Baale Mane in support of her feminist vision. The Open 10K saw the participation of more than 13,700 registered runners, a steep increase of 12 percent. Approximately 24,000 runners took to the roads of Bengaluru this May and it has emerged as Asia’s leading run over the last nine years.